A few years ago, a building in London known as the ‘walkie-talkie’ (actually 20 Fenchurch Street, but ever since the Gherkin it has been mandatory to give big expensive buildings extremely silly names. Can of Ham anyone?) started setting fire to shops and expensive cars. Let’s have a look at why that might be. Any inward curvature like this will act to focus the incoming light upon reflection. The fact that the tower curves over at the top also helps reflect the incoming light downwards onto the buildings it looms over. Intriguingly, the designer of the walkie-talkie Rafael Viñoly was also responsible for a similar ‘death ray’ in Las Vegas. Perhaps he assumed the notoriously feeble British sunshine could never be focussed to high enough intensities to ever cause damage? I’ll chronicle here my attempt to model this situation, inspired by this paper from my alma mater. While the paper is thorough, follows best scientific practices, and uses proper solar irradiance profiles, the visualisations left me wanting more. Casting proper science aside, let’s right that wrong and dig in. My initial thought was to model everything in Blender, and just let the rendering engine do all of the hard work of calculating light paths. 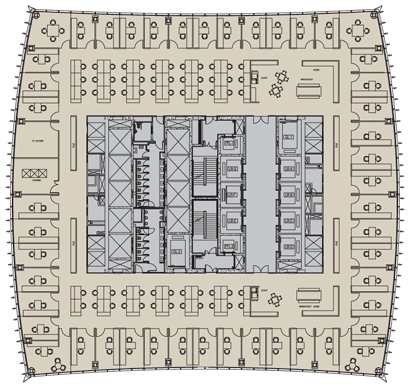 To draw up the building, I used the floorplans available here to get the shape correct, and smoothly interpolated the building shape between the floors. Floor 7, featuring some pretty sweet corner offices. I also used the surprisingly awesome export feature of OpenStreetMaps which includes building shapes and heights, then ran the export through the equally awesome OSM2World which spits out file formats readable by other 3D software – in this case, Blender. This was a bit disappointing – a faint splodge of white was not the death ray I was hoping for. Much fiddling with materials, lighting and renderer settings improved the render slightly, but it was still a struggle to generate anything which looked like it might melt a car. Here the incoming rays are spaced evenly in the plane normal to their direction, and so the density of rays at any point gives the light intensity. This is a simplified approximation, but will suffice for our purposes. The rectangular region contains the intersections between the reflected rays and the ground. The units on the axes are arbitrary. Frighteningly, a significant portion of the entire incident light field is focussed to a small point, with the rest spread behind it longitudinally. The non-uniformities in the transverse direction are probably due to non-perfect smoothing of the building mesh – focal spots are very sensitive to departures from surfaces of constant second derivative. From this surprisingly cool site, we know that in summer time in London, the sun is at 16 degrees at 8AM in the morning and 6PM in the evening. Given these are peak commuting times, the unwary commuter could have ended up with a nasty surprise! Indeed, the paper linked above concludes that sun intensities may have been boosted by a factor of up to 16 times. Fortunately, shortly after London started melting the developers applied some protective covers to the southern face of the building. This is much safer, and the right thing to do, but has the unfortunate side effect of completely ruining my chances of dropping the words ‘death-ray’ into casual conversation. Guess we’ll just have to wait for Rafael’s next great project. Here’s a fun problem I came across when trying to analyse some data, which I thought I’d write up to illustrate the kind of interesting puzzles I get paid to solve as a physicist. Perhaps have a go yourselves and let me know if there are more intuitive solutions. When taking a picture of my new 55″ TV (humblebrag) I noticed a diffraction pattern of the reflection of the camera flash. Fortuitously, I had also recently bought a slightly too-powerful laser pointer from China which is the perfect tool to investigate such problems. Here’s a little write-up of my DIY measurements. Given a few of my previous posts it’s obvious that I’m a fan of the physics and mathematics that that comes along with the theory of classical optics. To make the number of lens-based posts a nice round three then, here’s a simple Matlab App I made over the last few days which lets you play with lenses interactively, hopefully giving a bit of useful insight into the underlying principles. How does a lens make an image?